Mike emailed me the other day, saying that he was bringing home a zucchini that one of his guys brought in (apparently no one else wanted it). I figure I can always find a use for extra zucchini, right? Hilo was very nervous to approach it. 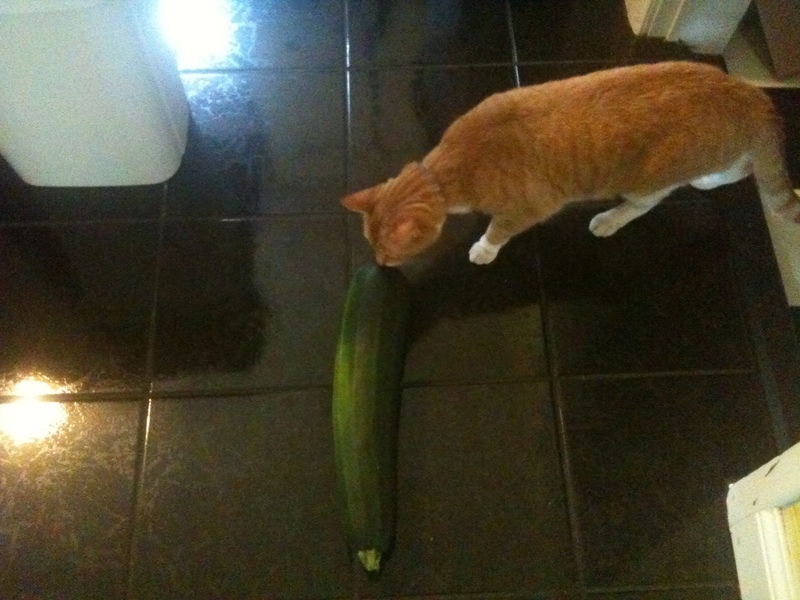 The zucchini is 17 inches long, which is about the same length as our other cat, Bandit, who is too much of a busybody to pose for such things as pictures with courgettes. I’m thinking on blanching it and freezing it for use this winter. Any other ideas? My suggestion for super huge ginormous zucchinis: carve it out, stuff with italian sausage (or whatever), tomatoes, cheese and bake. NOM! With big zucchini, I like to cut in half. Scrape out some of the seeds. Grate the rest. Drain. Blanch if you want to freeze and use later. OR. Use immediately without blanching to make chocolate zucchini bread, zucchini corn bread or zucchini fritters.